A Carlow candle creator who launched a family business via her daughter’s transition year project, will be featured on a national stage at Ireland’s biggest wellbeing event the Mind, Body, Spirit and Yoga Festival in the RDS, Dublin, from March 18 to 20. From her home in the village of Ballon, Elaine Kelly of NicAngels Candles produces beautifully marbled candles which are sold in craft markets and holistic fairs around the country. Her daughter Angela, now 21, helped set up what has become a family business when she was just a schoolgirl. 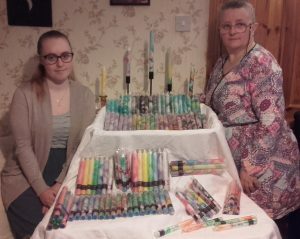 “In transition year, Angela took part in a mini company making marbled candles and she was so interested we encouraged her to keep it on, the whole thing just grew from there,” said Elaine. Very much a family affair the name NicAngels is a combination of the names of Elaine’s two daughters, Nicole and Angela, and both girls are involved in the trade. “We buy in the plain candles and by using a selection of some 30 different colours and shades we have created a whole range of different styles of marbled ones. Elaine is among a host of fascinating exhibitors and speakers at the inspirational festival which offers the chance to discover the latest in life enhancing positive psychology with 75 talks by top Irish and international experts plus exhibits by over 150 complementary and healing practitioners.